Your Art: Priceless or Worthless? How often are collectors, and dealers able to find fine ceramics in mint condition? It is increasingly rare due to growing demand and the ravages of time. From a personal view, I tend to favor objects that have aged gracefully—a few nicks or chips or even a brass rivet or two are not particularly distracting and certainly more affordable. Figures with missing parts, items that are broken, have degraded repairs or are unstable may indeed require restoration or conservation. Pottery is, of course, one of the longest-lived handicrafts. Its manufacture, whether utilitarian, architectural, or decorative has always moved in parallel with general artistic movements, and therefore, serves as a fair reflection of any era. Often the only surviving artifacts of earlier civilizations, ceramics are perhaps singularly the most important remnant to the archaeologist for dating, interpretation of technology, trade routes, religion and the simple reflection of daily routine. These interpretations could well be applied to ancient Mesopotamia, or colonial Williamsburg, as relics survive in abundance. Ceramics are generally durable and stable, yet we find the need to intervene for a number of reasons; chemical analysis for dating, reconstruction of shards for simple display, stabilization of surfaces or environment to prevent deterioration, and fabrication of missing elements to enhance value or to conceal damages. It is these latter areas which are the concern of the conservator and the restorer. Restorers can range from the hobbyist to the university trained with skill levels and orientation being remarkably varied. There are few standards and certainly no certifiable means by which the consumer can select a restorer or conservator of ceramics in the USA. It is important to know what types of restoration are practiced and what effect repairs may have on the value and the integrity of the object. I become Member of Russian Academy of Fine Arts in 1975. I may say that Russians, historically, have most advance education and technology in porcelain restoration and conservation. American ceramic restorers have been somewhat slow to adopt these changes primarily because there are no credible institutions teaching the craft and science of ceramic conservation and restoration in the states. Most of the training is in the form of popular short courses often instructed by the self-taught or from outdated "how to" texts. The cost of ceramic restoration is entirely dependent upon skill levels, training and demand. Charges may range from 15 to 150 dollars an hour. Some charge by the inch and others may (questionably) quote a charge on what an object can stand based on its value. It is difficult to shop around for estimates on your antique ceramics. Photographs, emailed JPEG’s and verbal descriptions of damages by phone are generally unacceptable for quotes. Expect to hand deliver or ship for estimation. 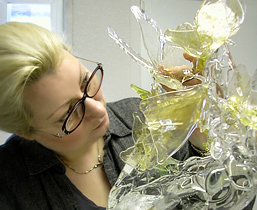 There have been many advances in techniques and materials in recent years. 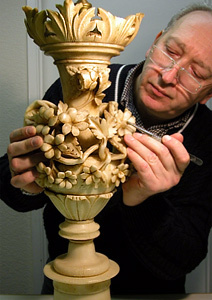 Professional restoration can be and must be absolutely implacable to bring the value of your Porcelain, Painting, Ivory, Jade and any other objects of Fine Art back to its best.